Homes for Sale in Southern Highlands. 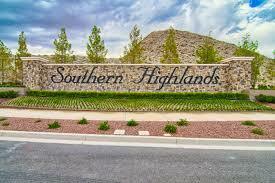 Southern Highlands is the premier, master-planned community located in Las Vegas, Nevada. Just minutes from the Strip, it’s quietly close to all Vegas has to offer while providing many luxury amenities to its residents. The community surrounds the exclusive Southern Highlands Gold Club and Spa while each distinct neighborhood has an array of parks, trails and recreational facilities set within the natural mountain surroundings. Community Schools, dining and shopping are close by as well, making the community an ideal setting for families with varied interests. Find your home in Southern Highlands. For Real Estate needs contact Tracy Drown at 702-245-9341. New Luxury Mediterranean Home 8,000+/- SQFT, Offers up-to 5 Bedrooms, 4 Car Garage, Office, Movie Theater, Lifestyle Wet-bar with Chic Wine Cellar, Gorgeous Master Retreat with Spa- Inspired Master Bath, Gourmet Kitchen, Home Automation pre-wire, Pocket Doors, Resort Style Pool & Spa. *Home renderings are subject to change during construction. Information Reliable, But Not Guaranteed. Absolutely gorgeous! Traditional Santa Barbara ranch style living with a warm contemporary blend. The home is built around a lush inviting courtyard. Lives like a single story with a 2nd level lodge-like retreat complete with large commercial sized wooden bar and billiard room overlooking incredible mountain and valley views. The private lot backs up to the community park with a seemingly invisible gated property line. STUNNING PANORAMIC VIEWS OF THE STRIP, REDROCK, MT CHARLESTON & CITY FROM THIS MAJESTIC BEAUTY! This 5 br home + separate office is on one of largest lots in the Bluffs. Single story w/walkout basement w/spectacular entry featuring custom Pivot door. Pocket doors & windows maximizing views & the indoor/outdoor lifestyle. Wet bar, infinity edge pool/spa, w/4k theatre, game room... FEATURED ON A POPULAR RENOVATION SERIES AS AN x201C;INSPIRATION HOME x201D;. Contemporary custom home features elegant formal dining w/Herringbone Brick Barrel ceiling, Travertine/wood flooring, plantation shutters, Viking appliances, Ceasarstone countertops, oversizd center island, double pocket glass doors, Venetian plaster, private backyard with fire feature and seating, 2 Verandas, casita with separate bath, pool and spa. THIS CUSTOM SINGLE STORY HOME W/ 6,1OO+ SQFT IS SITUATED IN THE DOUBLE GUARD GATED COMMUNITY OF VINTAGE VALLEY. 2 MASTER SUITES EACH W/ FIRE PLACE & TWO WALK-IN CLOSETS, STONEWORK, ARCHES. EXCEPTIONAL FINISHES THAT INCLUDE 4 FIREPLACES, SOLID MAHOGANY DOORS THROUGHOUT, EXPOSED DISTRESSED BEAMS, FLOOR TO CEILING POCKET DOORS. ENTERTAINER x2019;S PARADISE W/ GAME ROOM, COVERED PATIO x2019;S, WET BAR W/ PASS-THROUGH TO BBQ, OVERSIZE POOL WITH WATERFALLS & SPA.